I have a slideshow of my favorite pics that comes up after a few minutes of inactivity and goes for about 10 min until the screen blanks. I've been using KDE since the Stone Age (2006?). It's customizable. I love it. And now? Screensaver suddenly gone in my updated plasma5. I go looking for a solution. I come across a post by Martin Graesslin (sp?) saying nobody needs screensavers to protect screens and it's all about screen locking. I have to say it makes me cross that a simple functionality that just worked has disappeared because developers -- to whom I owe a LOT for a desktop I've been using for years -- don't work the same way I do. So I'm stuck wasting hours trying to get it back. That's why I use KDE. It's customizable instead of dictatorial. Anyway, pardon me for blowing off steam. I'm getting to my question, honest. There's a screensaver-y type functionality that doubles as a login screen because it's now a screenlocker. I want to make the whole login graphic go away. allows use of up arrow to move the login stuff off screen. The problem is that pressing any key returns you to the desktop and stops the screensaver. Is there some way to do this? Hey, thanks! It's taken me a long time to get back to this because Real Life happened. I'll try out your suggestion soonest. it's not just a screensaver. I have to login whenever it starts. That's a hassle. Aargh. I just want my pretty pics to start cycling. If there's a way to do the settings so that it acts like a *screensaver* not (NOT) a lock screen, I can't seem to figure it out. Thanks for the idea about gwenview! (Why didn't I think of that? ) Sounds like that would do exactly what I want. Not judging or saying anything negatie. Just makes me smile, and figure how old I am, since I have been using since 1998(?). 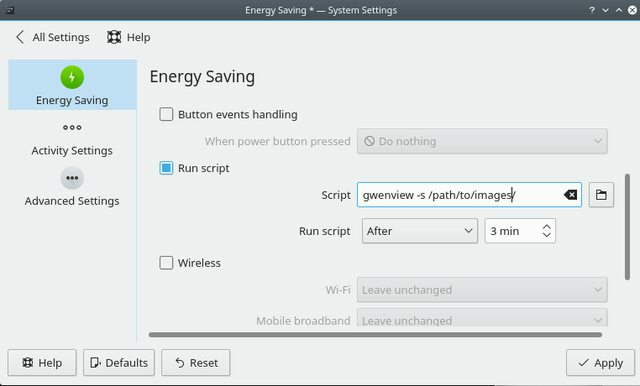 In the past KDE's screen saver would allow using xscreensaver modules. Currently (last 5-10 years?) it has been a pain to use xscreensaver.